Like many rural people, we have mice in our car. This isn't anything unusual. They crawl up from underneath the chassis and clamber through the duct work, and the next thing you know the roll of toilet paper you keep in the back seat for emergency purposes is chewed to shreds. The presence of mice also lends a certain... let us say immediacy to unloading groceries. 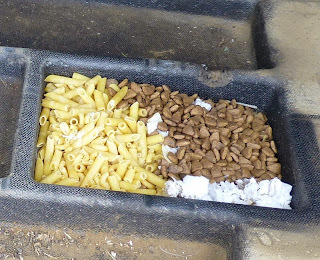 In this tray we have pasta and more dog food, padded with a bit of shredded toilet paper. What can I say? We have prepper mice. Organized prepper mice. This is the funniest thing I've seen/read in a long, long time! Not nice when mice get into the electricals of a car - we've had that too - shewed straight through everything almost overnight. That's amazing! I've never seen anything like it. Idaho mice are more organize than Pennsylvania mice. Now that I think about it they're more organize than most people I know. I've got a closet that need organized...would you consider renting them out? I once found that my parrot had been sharing her multi-seed mixture with a mouse. I discovered this when the cold weather came and I got out my Sorel boots. Each foot was full of seeds: safflower seeds in the right boot, sunflower seeds in the left. Quite a surprise! That is really amazing! Those mice could give me lessons on organization. I wonder if they went along for the ride whenever you took your car out. You know, to do a little sightseeing. Too funny! What a stitch! Protein, pasta and toilet paper. Essential staples all neatly piled and inventoried. That mouse has been reading this blog. that is so funny. the only thing my car mice did was to take the stuffing out of the driver's seat and make a nest on the air filter. I couldn't understand why my seat kept getting lower and accused my hubby of messing with it. They should start a blog. Or at least let them do a guest post! Like others mentioned, I could use some help organizing. Mice don't like moth balls. If you put some in a nylon stocking and put it in the wheel well, they will stay out. We also had some mice that stored their acorns in our fake Christmas tree. It was completely wrapped in plastic in the attic. When we brought it down and took the plastic off, all the nuts fell all over the place. I guess they recognized that the nuts came from a tree, so what better place to store them. Patrice - I read this post three times, and then studied the photos. I could not for the life of me imagine why you would be storing dog food and chocolate chips and pasta in trays in the trunk of your car. When I finally realized the MICE had done it, I spit my coffee out from laughing! Haha! Me too...except the coffee bit. I was like, "Patrice, dogs shouldn't really have chocolate." Lol. Just came to your blog based on this post and love it. Hilarious post!!! It's actually kind of amazing how neat and tidy they are, and actually seems like they are organizing things. Oh how I hate the mice at our farm. Sigh. They just recently chewed up some wires in our John Deere mower, and no one messes with that, ha. Thanks for the laugh. I'll be visiting regularly! I have to agree,,,Idaho mice are impressive in their organizational skills!! I also have to agree that moth balls can be used as a deterent. They don't last forever but kept them out of good stuff in the garage for about 3 years before I needed to throw around a fresh batch! We have that problem too. Just comes with living on a farm. The best combatant I have found is Rat Terriers. They kill far more mice than a cat. It is nothing for ours to wipe out 20 in one day after the fields have been harvested in fall and the mice & rats all go running for the house and barns. Since moving to a rural area, mice have nested in my car's AC unit twice, with a sad ending both times. Your mice are quite amusing. Ah, yes.....mice.......in the days when I had upward of ten dogs at the house, I hauled around a lot of dog food. Sometimes, I left a bag or two in the back of the car until I needed it. One day, on my way to a dog club meeting about thirty miles from home, my car just died After having it towed and examined, it became apparent that mice had chewed through the electrical stuff behind the dash. 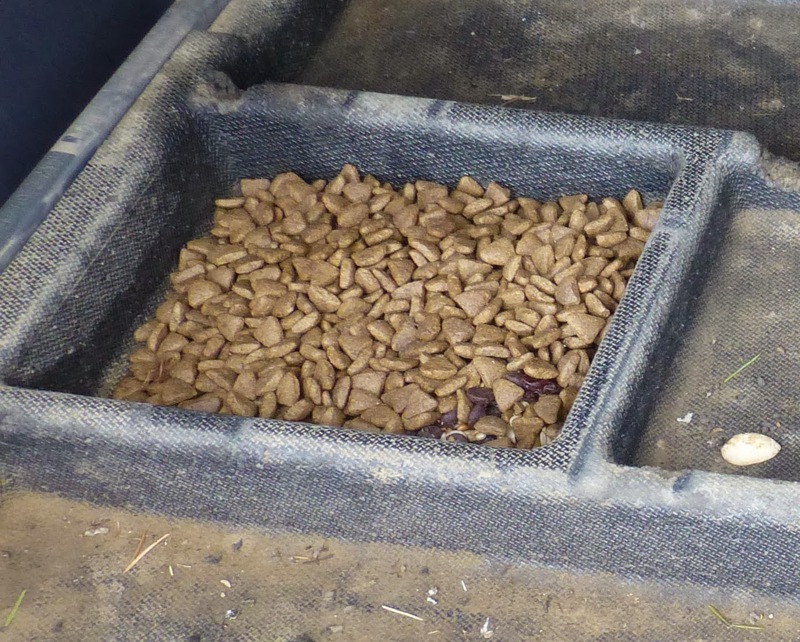 The mechanic's comment: "With that dog food back there, you're like the Pied Piper for mice!". Lesson learned. I just wanted to share with you our way of keeping mice out of anywhere you don't want them. First, to explain our family has two cabins in a very rural area. Sometimes it may be a few weeks before anyone is present at the cabins and mice have been an issue in the past, but no more. We go to the dollar store buy several bars of Irish Spring soap. Shred the soap in a food processor. Spread the soap in front of the garage door, exit doors or any other place you think they might be coming in at and in a circle all the way around the cabins and you will not have even one mouse! They hate the smell of Irish Spring and will not come around it at all. Of course you have to get rid of all of the mice currently in the building but after they are gone, you're done. You must refresh the soap about every 6 weeks or so but we haven't had mice in several years even with long periods of time of unoccupied buildings. Trust me, it works like a charm. We do this at our home as well and never have mice problems. The way we kept mice out of our hunting cabin was to soak cotton balls with peppermint essential oils and spread them around (by the doors & windows, on the beds, in the drawers, pantry). Anywhere you think a mice will find comfort or try to weasel in. You can use peppermint extract, but you will have to refresh them alot more often. I also have seen a recipe that takes baking soda mixed to a thick paste with water, then add the peppermint oil (30-40 drops) then pour into old ice cube trays or candy molds and let them dry, then place them where you want them. Bonus-- your house smells great and it keeps spiders away too. Oh my gosh - you're mice are AWESOME! Many years ago, we had a rather beat up car that served us well. When my daughter got into the passenger seat, she flipped down the visor, and a messy mouse nest dropped into her lap. Ewwww! My son was into making an ATV from parts. One day he found the muffler filled with shelled corn! It was supposed to be for the sheep! A while back, an uncle asked me to takea look at my great grandmother's car. It hadn't been run for quite a while since she died. I tried it and it started but was anemic - no power. The fact that they used the tissue in the pasta and beans as a desiccant? Amazing!! !